The president’s foreign-policy picks have set the stage for an aggressive military-first administration. In the splurge of “news,” media-bashing, and Bannonism that’s been Donald Trump’s domestic version of a shock-and-awe campaign, it’s easy to forget just how much of what the new president and his administration have done so far is simply an intensification of trends long underway. Those who already pine for the age of Obama—a president who was smart, well-read, and not a global embarrassment—need to acknowledge the ways in which, particularly in the military arena, Obama’s years helped set the stage for our current predicament. As a start, Nobel Prize or not, President Obama sustained, and in some cases accelerated, the militarization of American foreign policy that has been steadily increasing for the past three decades. In significant parts of the world, the US military has become Washington’s first and often only tool—and the result has been disastrous wars, failing states, and spreading terror movements (as well as staggering arms sales) across the Greater Middle East and significant parts of Africa. Indicators of how militarily dependent Obama’s foreign policy became include the launching of a record number of drone strikes (10 times as many as in the Bush years), undeclared wars in at least six countries, the annual deployment of Special Operations forces to well over half of the countries on the planet, record arms sales to the Middle East, and a plethora of new Pentagon arms and training programs. Nonetheless, from the New START treaty (which Trump has called “another bad deal,” as he does any deal the Obama administration concluded) to the Iran nuclear deal to the opening with Cuba, Obama had genuine successes of a sort that our present narcissist in chief, with his emphasis on looking “tough” or tweeting at the drop of a hat, is unlikely to achieve. In addition, Obama did try to build on the nuclear-arms-control agreements and institutions created over the previous five decades, while Trump seems intent on dismantling them. Still, no one can doubt that our last president did not behave like a Nobel Peace Prize winner, not even in the nuclear arena where he oversaw the launching of a trillion-dollar “modernization” of the US nuclear arsenal (including the development of new weapons and new delivery systems). And one thing is already clear enough: President Trump will prove no non-interventionist. He is going to build on Obama’s militarization of foreign policy and most likely dramatically accelerate it. It’s no secret that our new president loves generals. He’s certainly assembled the most military-heavy foreign-policy team in memory, if not in American history, including Gen. James Mattis (ret.) at the Pentagon; Gen. John Kelly (ret.) at Homeland Security; Lt. Gen. H.R. McMaster as national-security adviser (a replacement for Lt. Gen. Michael Flynn, who left that post after 24 days); and as chief of staff of the National Security Council, Lt. Gen. Keith Kellogg (ret.). In addition, CIA Director Mike Pompeo is a West Point graduate and former Cold War–era Army tank officer. Even White House adviser Steve Bannon has done military service of a sort. The military background of Trump’s ideologue-in-chief was emphasized by White House spokesman Sean Spicer in his defense of seating him on the National Security Council (NSC). Bannon’s near-brush with fame as a naval officer came when he piloted a destroyer in the Gulf of Oman trailing the aircraft carrier USS Nimitz that carried the helicopters used in the Carter administration’s botched 1980 attempt to rescue US hostages held by Iran’s revolutionary government. As it happened, Bannon’s ship was ordered back to Pearl Harbor before the raid was launched, so he learned of its failure from thousands of miles away. When it comes to national-security posts of any sort, it’s clear that choosing a general is now Trump’s default mode. Three of the four candidates he considered for Flynn’s spot were current or retired generals. And that’s not even counting retired vice-admiral Robert Harward, who declined an offer to take Flynn’s post, in part evidently because he wasn’t prepared to battle Bannon over the staffing and running of the NSC. The only civilian considered for that role was one of the more bellicose guys in town, that ideologue, Iranophobe, former UN ambassador, and neocon extraordinaire John Bolton. The bad news: Trump was evidently impressed by Bolton, who may still get a slot alongside Bannon and his motley crew of extremists in the White House. Another early indicator of the military drift of future administration actions is the marginalization of Secretary of State Rex Tillerson and the State Department, which appears to be completely out of the policy-making loop at the moment. It is understaffed, underutilized, slated to have its funding slashed by as much as 30 percent to 40 percent, and rarely even asked to provide Trump with basic knowledge about the countries and leaders he’s dealing with. (As a result, White House statements have, on several occasions, misspelled the names of foreign heads of state, and the president mistakenly addressed the Japanese Prime Minister as “Shinzo,” his first name, not “Abe.”) The State Department isn’t even giving regular press briefings, a practice routinely followed in prior administrations. Tillerson’s main job so far has been traveling the planet to reassure foreign leaders that the new president isn’t as crazy as he seems to be. Although Secretaries of State Hillary Clinton and John Kerry were far more involved in the crafting of foreign policy than Tillerson is likely to be, the State Department has long been the junior partner to its ever-better-resourced counterpart. The Pentagon’s budget is currently 12 times larger than the State Department’s (and that’s before the impending Trump military build-up even begins). As then–Secretary of Defense Robert Gates once noted, there are more personnel in a single aircraft-carrier task force than there are trained diplomats in the US Foreign Service. Given the way President Trump has outfitted his administration with generals, the already militarized nature of foreign policy is only likely to become more so. As former White House budget official and defense expert Gordon Adams has pointed out, his military-dominated foreign-policy team should be cause for serious concern. Policy-by-general is sure to create a skewed view of policy-making, since everything is likely to be viewed initially through a military lens by men trained in war, not diplomacy or peace. For the military-industrial complex, however, many of Trump’s national-security picks are the best of news. They’re “twofers,” having worked in both the military and the arms industry. Defense Secretary Mattis, for instance, joined the administration from the board of General Dynamics, which gets about $10 billion in Pentagon contracts annually and makes tanks and ballistic-missile submarines, among many other weapons systems. Trump’s pick for secretary of the Air Force, former New Mexico Representative Heather Wilson, is an Air Force veteran who went to work as a lobbyist for Lockheed Martin’s nuclear weapons unit when she left Congress. Deputy National Security adviser Keith Kellogg has worked for a series of defense contractors, including Cubic and CACI. (You may remember CACI as one of the private companies that supplied interrogators implicated in the Abu Ghraib prison torture scandal during the US occupation of Iraq.) This practice is rife with the potential for conflicts of interest, as such officials are in a position to make decisions that could benefit their former employers to the tune of billions of dollars. While rule by generals and weapons company officials may be problematic, an even more disturbing development is the tendency of President Trump to rely on a small circle of White House advisers led by white-nationalist Steve Bannon in crafting basic decisions, often with minimal input from relevant cabinet officers and in-house experts. A case in point is Trump’s disastrous rollout of his Muslim ban. Homeland Security head John Kelly asserts that he was consulted, but Bannon disregarded his advice to exclude green card holders from the initial ban. Kelly later issued a waiver for them. Mattis was evidently only informed about the contents of the executive order at the last minute. Among the issues he later raised: The ban was so expansively drawn that it could exclude Iraqi translators who had worked alongside American troops in Iraq from entering the United States. Now that the courts have blocked the original plan, the Trump team is working on a new Muslim ban likely to be almost as bad as the original. And the fingerprints of Bannon and his anti-immigrant sidekick Stephen Miller will be all over it. Numerous commentators have welcomed the appointments of Mattis and McMaster, hoping that they will be the experienced “adults in the room” who will help keep Bannon and company in check. Former Obama Pentagon official Derek Chollet, a member of Foreign Policy magazine’s “shadow cabinet,” put it this way: “Other than the dark figures in the White House cabal, Trump’s national security team is led by nonideological, level-headed policy technocrats from the military or industry.” President (and also General) Dwight D. Eisenhower, who introduced the term “military-industrial complex” in his farewell address to the nation, is probably rolling over in his grave at the thought that a government packed with ex-military men and former arms industry officials is in many quarters considered the best anyone could hope for under the Trump regime. Let’s think for a moment about what such a “best case” scenario might look like. Imagine that, in the battle for Trump’s brain, Mattis, McMaster, and Kelly wrest control of it from Bannon and his minions when it comes to foreign-policy decision-making. The assumption here is that the generals have a far saner perspective than an extreme ideologue (and Islamophobe), among other things because they’ve seen war up close and personal and so presumably better understand what’s at stake. But we shouldn’t forget that Mattis and McMaster were at the center of one of the most disastrous and unsuccessful wars in American history, the invasion, occupation, and insurgency in Iraq—and it appears that they may not have learned what would seem to be the logical lessons from that failure. In fact, as late as 2011, overseeing Washington’s wars in the Greater Middle East as the head of Central Command (CENTCOM), Mattis actually proposed a radical escalation, an expansion of the conflict via a direct strike inside Iran. The Obama administration would, in fact, remove him as CENTCOM commander five months early in part because the president disapproved of his proposal to launch missile strikes to take out either an Iranian power plant or an oil refinery in retaliation for the killings of US soldiers by Iranian-backed militias. In August 2010, shortly after taking control of Central Command, Mattis was asked by President Obama what he thought were the top three threats in his area of responsibility, which stretched from Egypt to the former Soviet republic of Kazakhstan and included the active war zones of Iraq and Afghanistan. His classic (and chilling) response, according to a “senior U.S. official” who witnessed it: “Number one: Iran. Number two: Iran. Number three: Iran.” He will now have a major hand in shaping Washington’s Iran policy. Boosters of the surge in Iraq frequently refer to it as if it were partial redemption for the disastrous decision to invade in the first place. At a staggering cost in money and Iraqi and American lives, that invasion and occupation opened the way for a sectarian conflict that would lead to the rise of ISIS. It cannot be redeemed. And the suggestion that things would have turned out better if only President Obama had kept significant numbers of US troops there longer—overriding both the will of the Iraqi parliament and a status of forces agreement negotiated with Iraq’s leaders by the Bush administration—is a pipe dream. Logically, the American experience in Iraq should make both Mattis and McMaster wary of once again using military force in the region. Both of them, however, seem to be “go big or go home” thinkers who are likely to push for surge-like actions in the war against ISIS and possibly in the Afghan war as well. 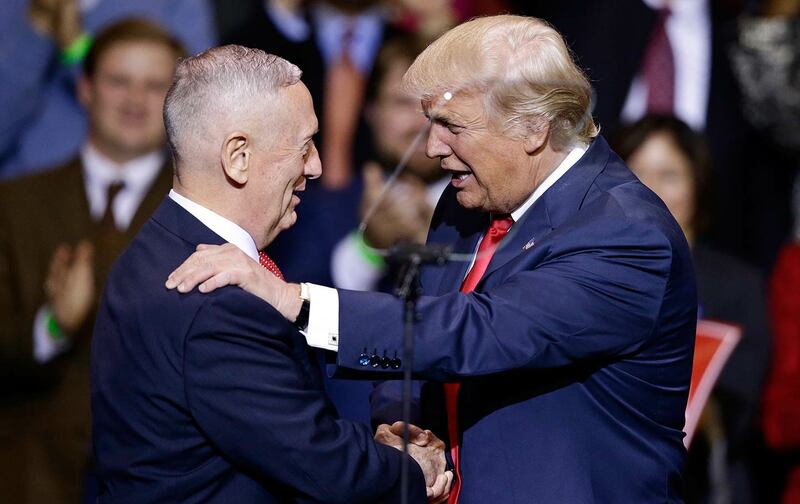 The true test of whether there will be any “adults” in the room may come if Trump and Bannon push for military action against Iran, an option to which Mattis has been open—as a long history of statements and proposals urging exactly that course of action indicates. Such a war would, of course, be better sold to Congress, the public, and the media by the generals. Trump’s generals should know better, but there’s no reason to believe that they will, especially given Mattis’s history of hawkish proposals and statements about “the Iranian threat.” Even if he and McMaster do prove to be the adults in the room, as we all know, adults, too, can make disastrous miscalculations. So we may want to hold off on the sighs of relief that greeted both of their appointments. Washington could go to war in Iran (and surge in both Iraq and Afghanistan), regardless of who’s in charge.